This article looks into some of the reasons why a plant might fail and suggests how to get plants to flourish in future. Information on pot labels can often be over-generous on the range of depths, noting tolerated depths for well established mature plants, rather than ideal depths. Even then, young plants may need time to adapt in the shallows before being moved to deeper water. Plants often give us clues on how well they adjust to varying water levels. Those with tall upright stems like Reedmace (Typha) are usually very tolerant of varying water depths, whilst shorter leafy plants like forget-me-not (Myosotis) will drown if put too deep too soon. Some plants sold as aquatics aren’t true aquatics at all, and must have their crowns above water level to survive. Hostas like damp and humid conditions but rot off if fully submerged. 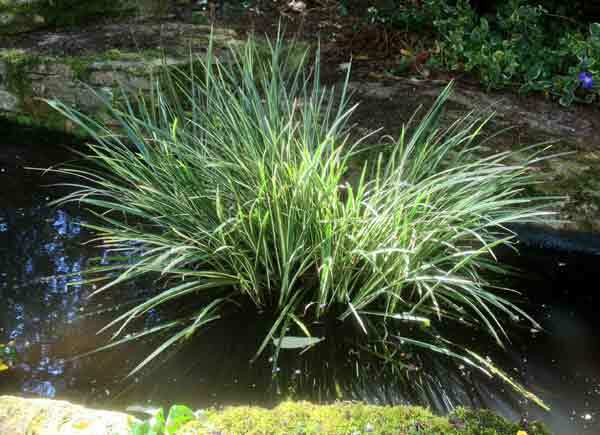 Other plants just dislike stagnant water, but will often thrive when placed in moving water e.g. some of the Mimulus family. Many moisture-loving Primulas come from areas with heavy rainfall, but grow in free draining hillsides where the water is never stagnant. In a moisture area of our gardens, they often benefit from some grit in the surface layer to stop the crowns and leaves from getting too wet. The giant Himalayan cowslip P. florindae is perhaps the most moisture tolerant of this group, one of the few that will grow right up to the pool’s edge. The Iris family has very differing moisture requirements. I. sibirica likes moisture but is not aquatic, I. ensata tolerates temporary flooding, whilst I. laevigata is most happy in very shallow water. I. versicolor and I. pseudacorus grow well in slightly deeper water too. All plants need some sunlight, but too much can damage certain plants, especially if they are grown at a lower latitude than their native territory. Water forget-me-not and marsh marigolds can scorch and pick up fungal infections if they overheat, so may need more cool water or shade when planted in warmer climates. Growing information isn’t always correct. I’ve seen dwarf sweet-flag (Acorus gramineus variegatus) labels suggesting that full sun was essential, yet plants in these conditions often get brown scorch marks and I’ve found the plant to do much better in dappled shade. Perhaps that’s due to the variegations, as a number of variegated plants can burn if grown in too bright sunlight. The internet can be a source of both good and bad information. Researching Acorus gramineus information from its native Far East reveals that in the wild it is often found in rocky deep-cut mountain streams where its ‘sticky’ roots cling to the stones, holding it firm despite spates, whilst keeping it low enough to be sheltered from the worst of the wind and sun. Dwarf Sweet Flag prefers dappled shade, and not full sun as some labels might suggest. Shelter is also important for many large leafed plants like the Hostas and Rodgersias which need protection from drying winds and scorching sun, especially if they run short on moisture. Some plants are not winter hardy, like water hyacinth (Eichhornia) and are treated as annuals in more temperate climates. Other plants are not reliably perennial (even though some may be sold as such) e.g. Cotula coronopifolia (Brass buttons) usually needs to be re-grown from seed each year. Moderately hardy plants like the giant Gunnera may need dry mulching with straw in the winter, with the old leaves folded in to protect the crown from frost, whilst semi-tropicals like Cyperus alternifolius and Thalia dealbata can often get through the winter as long as the crown is deep enough below the ice. The white calla lily (Zantedeschia aethiopica) may also survive in these conditions providing the plant is mature enough, or do better in a drier protected border in the winter. Certain species may come from a very wide geographic range – such as the marsh marigolds (Caltha spp) and pickerels (Pontederia spp. ), and their characteristics have evolved to suit the different conditions in the local area. Calthas from exposed, colder areas are often shorter and later flowering (e.g. Caltha palustris var. radicans), and Pontederias from warmer areas are often taller and more frost tender than their cold region cousins. If a plant fails, don’t give up on it without investigating – you may have purchased an inferior strain, or a strain from very different conditions to your own, and a plant from a different source may do a great deal better. For some hard to identify plants like the water crowsfoot (Ranunculus spp.) you may have purchased a species from moving water that will never flourish in a pond situation as a true still-water species would, and your supplier (or that book recommending a particular species) may have muddled the identity. Crowsfoots can also be short lived, as they play a role in plant succession in the wild, with parts of plants breaking off or seeding elsewhere to colonise new habitats, rather than forming permanent/long-lived clumps in one place. 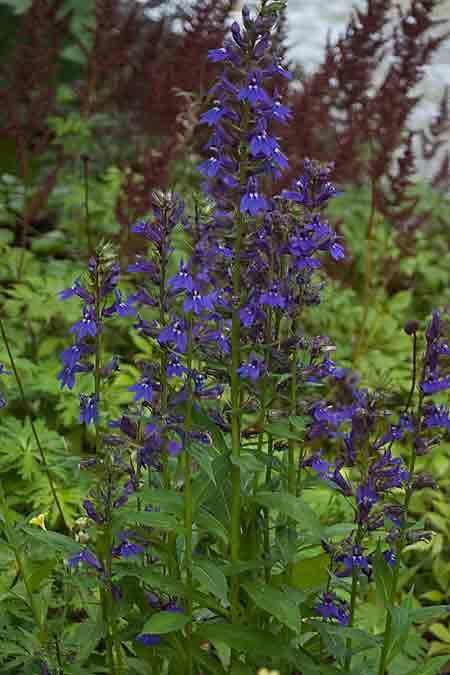 Herbaceous Lobelias might also fall into this short-lived category as they often seem to disappear after a few years. Is this a winter kill; or severe snail damage; or just their way of telling you to take cuttings more often, and spread them elsewhere? The water hawthorn (Aponogeton distachyos and related species) can die back temporarily following flowering, with the old leaves devoured by snails. Where the water is especially shallow or warm the plants may go into a dormant phase, only reviving when cooler conditions arrive. Although many water plants are amazingly adaptable to differing water conditions, some are more particular. Moisture-loving Sarracenias grow well in softer water and acidic conditions which are often nutrient-low, and they can survive where other plants can’t due to their carnivorous nature in obtaining nutrients. Most of these plants don’t adapt well to hard water and alkaline conditions, though some garden strains have been selected for their tolerance. Water violet (Hottonia palustris) often struggles in new ponds, whatever the pH, but seems to do well in aged mature water – perhaps humic acids help here? Amongst the waterlilies N. alba and N. odorata are found in a wide range of water conditions whilst the N. alba rubra subspecies was sourced from a soft water, acid lake, and some of the hardy red cultivars might have inherited this preference. Many growers report that certain cultivars thrive in one spot but struggle in nearby sites with slightly different soil or water conditions. In our own gardens we are unlikely to be able to provide a range of water conditions, and must stick with the tap or rainwater sources that we are given. With this limit, we must realise that not every plant will relish the conditions we can offer, and we must learn to either choose the best suited plants, or go to the trouble of adjusting our water to match. I prefer planting into individual pots/baskets to give each variety a fair chance. Where plants are mixed, those of different growth habit (e.g. Iris and water forget-me-not) may co-exist happily, but in other cases one plant tends to outcompete the other. This is more of an issue for submerged aquatic plants as they spread through the pond. The submerged Hydrocharitaceae (like Egeria/Anacharis, Elodea, Lagarosiphon and Hydrilla) are strong growers or invasives,. They are able to continue photosynthesising at much higher water pH than most other plants because they can use bicarbonate in the water as their carbon source. As they use this bicarbonate (often depositing marl on their upper leaf surface in the process) the pH rises further still, preventing many other submerged aquatics from photosynthesising. Floating plants can blanket out the light to all submerged plants, also having a very negative impact on oxygen levels. Other competition can be from animals, like koi or waterfowl, who may give softer plants short shrift. Beyond straightforward competition there is warfare too. Allelopathy is the term used to describe where plants release chemicals that can damage, inhibit, or repel other organisms. In some cases these agents are only released when a plant is damaged e.g. by insect pests. Plants such as these may be strongly aromatic, like Lizard’s Tail (Saururus) and the closely related Houttuynia which both release lignoids when damaged. Myriophyllum spicatum releases phenolic compounds that can prevent film-algae growing directly on the leaves (though this doesn’t seem to stop blanketweed growth). Maybe other similar interactions are taking place between plants that we are unaware of? Don’t ignore the possibility that the loss of your new plant has been caused by disease. 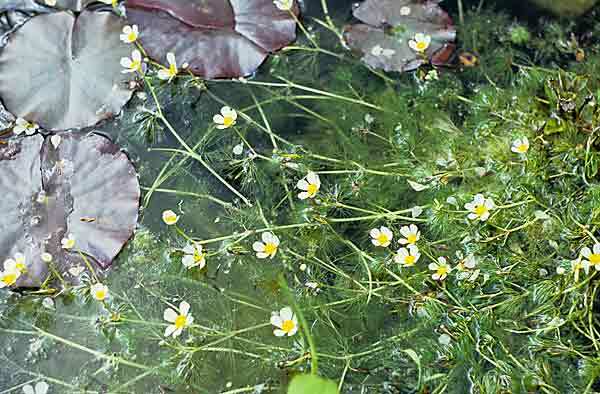 Most of us have seen the devastating effect of waterlily crown rot (thankfully not too common these days), and other fungal, bacterial, and viral infections can cause major problems. These all act as a warning to maintain high standards of biosecurity. Quarantine new purchases elsewhere before introducing them to your main pond. Websites like http://www.ispotnature.org/ (which covers four worldwide communities/localities), the GRIN database http://www.ars-grin.gov/cgi-bin/npgs/html/tax_search.pl and Wikipedia are just a few of the places that give information about the native origins and habitats of plants. Investigating the right place for your plants, and finding out about their natural habitats, can turn up other interesting plants that grow in similar conditions. Some of these plants might be worth a try e.g. the red hot poker of general gardens (Kniphofia caulescens) has some relatives that grow in marshes and on streamsides in their native South Africa (e.g. K. breviflora) – worth investigating? So, if that new purchase falls by the wayside, don’t reject it completely. With fresh insight on its requirements a re-purchase might end up taking pride of place in your water garden. This entry was posted in Technical Bulletins by James. Bookmark the permalink. We have a large 12″ trench across bottom of garden which gets lots of runoff water from neighbors gardens. We have water marigolds planted in this trench. There is a layer of leaves and I do not remember if marigolds will grow through these leaves or whether I should remove them (the leaves). We have new landscaper who wants to remove leaves. These water marigolds are now two yrs old and last yr were beginning to spread. Your answer will be appreciated. Marsh Marigolds (Caltha spp.) should be able to grow through a thin layer of soft leaves. If you had a thicker layer of fallen leaves over them, or the leaves were of a coarser type that won’t easily decompose, then it would be worth lifting those off to allow the marsh marigolds to get going.